MAN Truck & Bus will be presenting a comprehensive array of buses to showcase its diverse portfolio at the IAA Commercial Vehicles fair in Hanover, the leading trade fair for mobility, transportation and logistics which takes place from September 22 to September 29, 2016. The buses on display will demonstrate new features for increased efficiency and sustainability. MAN’s unwavering commitment to the continued development of its products is clearly reflected in the evolution of the MAN Lion’s City bus. Over the past three years, the MAN Lion’s City has been consistently optimized in order to offer customers top quality and maximum benefit. With a focus on constant enhancements to deliver multiple benefits, the MAN Lion´s City Bus has seen several key measures implemented from weight optimization, improved serviceability, greater passenger capacity as well as significantly lower fuel consumption. Particular attention has been paid to efficiency and optimization of fuel consumption. In addition to various weight-reducing measures and Euro 6 exhaust technology, other features include idle shutdown and improved software automatic transmissions as well as power-saving interior lighting and LED displays. Other features, such as the two-stage air compressor with automatic idle system and optimized cowl flap, also help to reduce fuel consumption. As of Spring 2016, MAN Lion’s City will also be available with the DIWA6 automatic gearbox by Voith. Customers not only benefit from a marked reduction in fuel consumption, but also from lower noise emissions, achieved by optimum integration of the gearbox into the drivetrain. Besides the development of softer switching operations and an improved, terrain-based switching program for lower engine speeds, wear and durability of the entire drivetrain are also improved. With progressive governments across the Middle East increasingly looking into sustainable transport solutions, MAN’s portfolio of CNG buses and experience as Europe’s unchallenged leader in natural gas buses is a big plus. One fifth (22 percent) of the city buses sold by MAN in the past year run on CNG. The natural gas drive is an alternative to the conventional diesel engine that significantly outperforms the current stringent emissions standard without the need for any additional filtering technology or fuel. With no need for technical modifications, such buses can also run on treated biogas, thus making operation virtually CO2 -neutral. MAN currently offers the widest portfolio of natural gas buses on the market, with solo and articulated buses from 12 m to 18.75 m lengths and in low-floor (LF) and low-entry (LE) versions. With intercity travel increasing across the Middle East, MAN’s long distance coach portfolio in the form of MAN and Neoplan coach will prove to be especially relevant for the region with several new technology features adding to their versatility and overall efficiency. 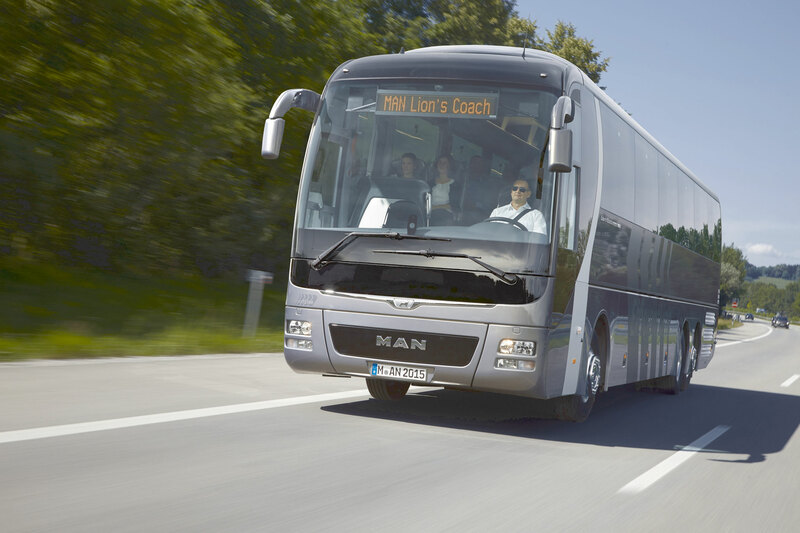 For MAN and NEOPLAN coaches, MAN provides a cruise control device that can anticipate the route called MAN EfficientCruise, with the latest generation including even more enhancements. The assistance system takes into consideration upcoming upward and downward sections along the current route and adjusts the drive position and vehicle speed wherever possible for a more cost-effective driving style. The new EfficientCruise includes a range of enhancements such as a further optimized speed adjustment system which anticipates the route and also actively shifts gears. Another innovation comes in the shape of the EfficientRoll freewheel feature in the new generation EfficientCruise, which delivers added efficiency even on slightly downward gradients by automatically switching the gearbox to neutral (N) and allowing the bus to travel with the lowest possible engine friction loss. Fuel savings of up to 6% were possible with the previous generation of the EfficientCruise feature, and this new function enables a further increase in fuel efficiency. With its extensive bus chassis product portfolio, MAN has the solution for every situation. The range covers the low-floor, low-entry, high-floor and front-motor segments for body lengths of between 10.2 m and 27 m, European stages Euro 3 to Euro 6, as well as CNG engines for use in city and intercity buses. For countries where high-sulphur fuels are used, MAN offers coach chassis with SCR technology to meet Euro 4 and EEV standards. For countries where import duties are charged on chassis, these are also available as parts kits (chassis in the box – CIB). All coach and inter-city chassis are available with the latest safety and comfort systems: adaptive cruise control (ACC), emergency electric brake assist (EBA) and the lane guard system (LGS) for lane monitoring. The rain/light sensor will be offered as an option on all city bus and coach chassis from the beginning of 2017. MAN works together with over 80 body builders. This collaboration is constantly being consolidated in order to ensure customers a consistently high level of vehicle quality. Thanks to our many years' experience with electrified drivetrains and the electrification of further components in the MAN Lion's City Hybrid, MAN Truck & Bus is also in an excellent position to provide transport companies with a practical and efficient solution in the electric bus segment. At the IAA 2016, MAN will be demonstrating the integration of different charging and storage systems in a single technology platform. By 2018, the MAN e-mobility roadmap will offer the public a pre-series bus version of a battery electric vehicle (BEV). We will be starting series production of a 100 percent electrically driven city bus before 2020. Before 2030, MAN Truck & Bus plans to have 50 percent of its sales in the city bus segment consisting of emission-free vehicles. Accommodating for the demanding operating conditions in the Middle East, MAN Truck & Bus Middle East provides full-fledged turn-key solutions for both goods and passenger transportation by road through its light (TGL), medium (TGM) and heavy-duty (TGS WW) ranges of trucks, and MAN and NEOPLAN buses & coaches that provide basic to VIP luxury transport and travel requirements.